The return of the produce box. This week’s mystery box included a few pleasant surprises…namely raspberries and strawberries, grown in November thanks to solar energy and plastic. The box also included at least 6 types of green leafy items yet to be identified. A new game…name this green! I’m not sure if any of them are tasty raw, but I’ll find out soon enough. In the pottery bowl are various root vegetables (I see roasting in their future). I expect to be making Indian food this week with one of our house guests. She brought with her several delicious sounding recipes that may incorporate a few of the produce box items. We also plan to visit the Indian Market for new spices. We’ll be sure to share our creations via the blog later this week. 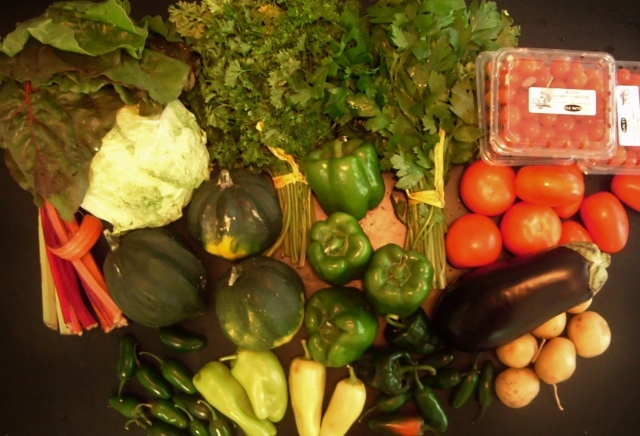 One of the big changes for this month is a commitment to buy the CSA produce box. 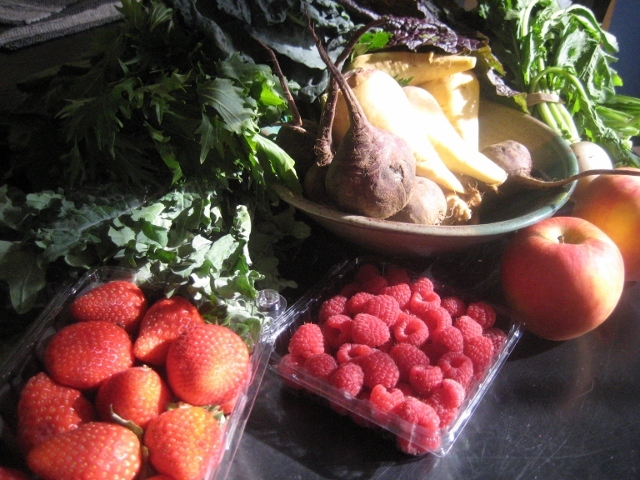 It’s not too much of a sacrifice in July – what an amazing bounty of foods! So it appears that I have: chard, cabbage, parsley, flat-leaf parsley, 3 boxes of grape tomatoes, 3 acorn squash, 4 bell peppers, salad tomatoes, roma tomatoes, an eggplant, potatoes and a bunch of random peppers. The chard already went into a Veggie Pancake – sauteed with onions, it was very good and bodes well for the greens to come this fall and winter. The roma tomatoes will probably go with the 25 pound case I bought this week to freeze. The other ones we’ll just munch on. The bell peppers will most likely be made into stuffed peppers – we had them last week and they were tasty but unphotogenic (which is why you didn’t hear about them). I found several options for the squash involving butter, brown sugar and possibly maple syrup. Potatoes are never a problem. Maybe some sort of cole slaw for the cabbage. So, that leaves the eggplant, the parsleys, and the peppers…any suggestions – especially for the eggplant, which looks to be a hard sell in this house…Thanks! !